I've been coming here on and off for over 30 years and it hasn't changed much. 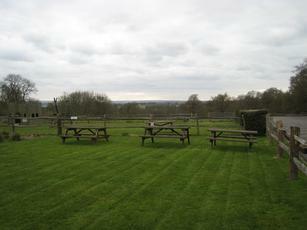 OK it has - they stuck a dining room on the back about 15 years ago - but the pub itself, and the lovely garden with the views, feels unchanged. It's a good pub without being anything special, decent food at a fair price and a fine pint of Larkins - only the one handpump on my recent visit - and not so green wellie as the Rock. So worth a stop if you're in the area, or if you've been to Annie's up the road (Queen's Arms) and need some food. 20 minutes walk up the hill from Cowden Station; you can roll back down in 15 if you've had enough! I had lunch here yesterday and funnily enough had the lasagne like the last reviewer. I thought it was very nice and definitely looked and tasted home cooked, it was also very good value. I felt welcomed and the pub is dog friendly so that wasn't a problem either (as I had my mutt with me). There's a lovely big garden and separate play area which I'd imagine would be great to keep children occupied while also being able to keep an eye on them. 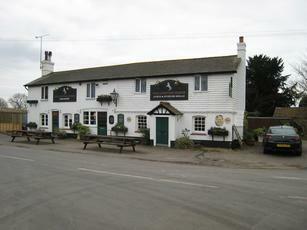 All in all, a nice country pub and great value for lunch. It is pub food not restaurant food but does what it sets out to do very well in my opinion and I'll definitely be going back. Waited ages at the bar before being acknowledged by the barmaid. Yes, you do have to change the roll in the credit card machine; yes, you should serve earlier customers first; yes, I should wait my turn. But it would have been nice to get a welcoming smile and some comment along the lines of 'sorry I won't be a minute'. An unwelcoming start. The Larkins was terrific. But the food was really poor: my lasagne was cold and tasteless - I kept adding salt in the hope of finding some flavour, but no luck. This despite the fact that it came from the 'home-cooked' specials board. Twenty quid for two is cheap, but I'd rather have paid thirty to have pleasant welcoming service and food that was edible. Especially a smile costs nothing. Recommended for drinking only - and then more for the regulars than the staff. Sorry - can't give it more than a 4. I've used this pub for eating on occasions and have been satisfied in the past, but what a change! I ordered a curry which was nothing more than badly defrosted vegetables in pathetic excuse of a sauce which had not a single curry spice in it. My companion ordered scampi which again had recently seen the inside of catering freeze bag. Just these two meals �16! I rated this pub as an eight last time this time it gets one for the garden.